With Thanksgiving just days away you’re likely taking mental notes of the things that are important to you—things that you can’t imagine living without—your spouse, your children, dear friends, your faith, a washing machine, dishwasher, microwave…your planner. You would include your planner on that list, wouldn’t you? 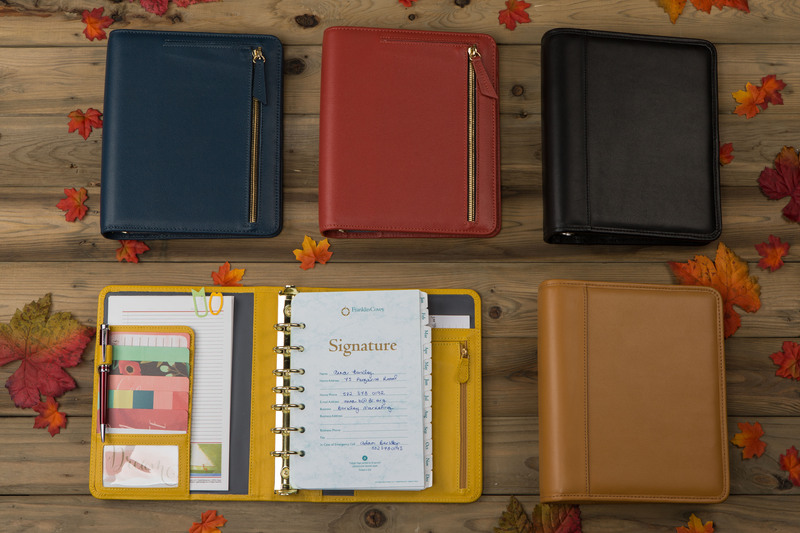 After all, there are all sorts of reasons to be thankful for your planner. Your planner helps you to be more accountable for the way you spend your time. It’s your appointment keeper, your daily reminder, and your goal tracker. In a way, it’s your secretary for life. It helps you stay on top of your schedule, manage your time, and spend more time doing what you want to be doing. It makes you dependable and reliable. As you check off your tasks and track your daily progress, your planner becomes a great source of motivation. After all, who doesn’t like to cross things off their lists as they complete them? Speaking of lists, isn’t it nice to write a list and know exactly where it is? Before your planner, how many times did you write a grocery list and lose it before you actually went shopping? Not any more. Now your planner can be your grocery list shelter, your password protector, and your library book due-date reminder. It can help you keep track of the movies you’d like to see, the books you’d like to read, and the recipes you want to sample for dinner. All of those lists are safely protected in your planner. Your planner keeps you grounded. It helps you view your life from the ultimate zoom lens—allowing for a broad perspective of the big picture and an up-close view of the slightest details necessary to make it all happen. It’s the ideal place to track your long-term goals, aspirations, and dreams, as well as the daily action items to ensure you reach them—from planting seeds to drinking enough water to even budgeting your lunch expenses. In that same vein, your planner can help you keep tabs on each of your life roles: spouse, child, sibling, parent, employee, friend, and more. You can quickly assess where you are spending most of your time and effort and where you need to improve. But it doesn’t stop there. Once you have that information, your planner is the perfect tool to walk you through that process step by step—so you can find more balance in your life and feel greater peace. Your planner is your personal assistant, helping you make the most of your time and energy. It’s ready to be your idea organizer, your project coordinator, and your budget monitor. It makes the perfect networking list, on-the-go directory, and coupon organizer. Imagine the time you’d lose if you had to keep all that information in separate places! Your planner is your secret keeper— an ideal location for birthday and anniversary reminders, holiday shopping lists, and the phone number for your favorite floral shop. There is nothing quite so rewarding as seeing a surprise come neatly together. That’s the power of a planner. Your planner can keep you a half step ahead of the chaos of life as you manage doctor and dentist appointments, parent-teacher conferences, and your children’s vaccinations. It’s where you’ll plan vacations and schedule time for soccer games and music recitals. Planning keeps you where you want to be and ensures you spend time with the people who matter most, no matter how crazy your world becomes. It’s your idea vault—the perfect place to store favorite quotes, doodles, and interesting tidbits you hear throughout the day. That way it becomes a great source of creativity for your next project or presentation. It’s a great way to avoid debt. Your planner is the perfect place to monitor your budget and track your finances so you can enjoy more financial freedom. All that said, a planner is a great way to tell your life story. Imagine your grandchildren thumbing through your planner one day. What would they learn about you? They may marvel at the cost of gasoline, or the things that occupied your time, but most likely they’ll realize the sort of person you were striving to be, and the good you were working to accomplish. In that way, your planner is the ideal embellishment for your life story, and should you choose, you can even add some planner embellishments of your own to keep it all interesting. This holiday season as we focus on the gifts we enjoy each day, let’s take a minute to consider how lucky we are to have and use a planner—because our time is precious and our planners help us make the most of it.